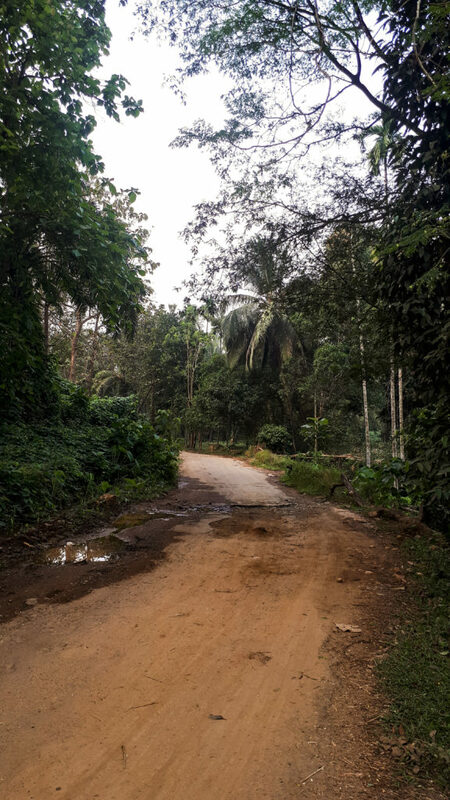 Roads were good for the most part, except for a few bad patches through a palm tree plantation between Angamaly and Athirappilly. 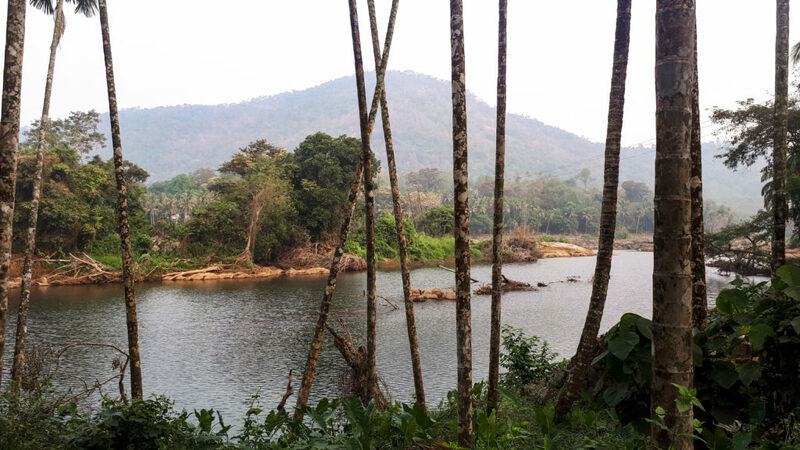 The plantation was on the banks of the river Chalakuddy, the same river on which both the waterfalls are present. 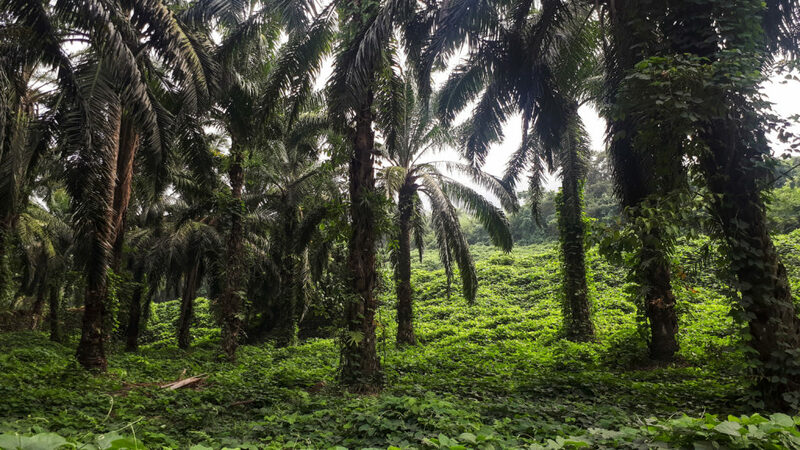 A layer of creepers had cloaked the floor of the plantation making the entire scene worth the bumpy ride. Do note that the road through the plantation area is closed after 6:30 PM. On the way we had refreshing pepper coffee and chai at a small tiffin center run by a local family. Although we could not communicate with them, their smiling faces made us feel very welcome. 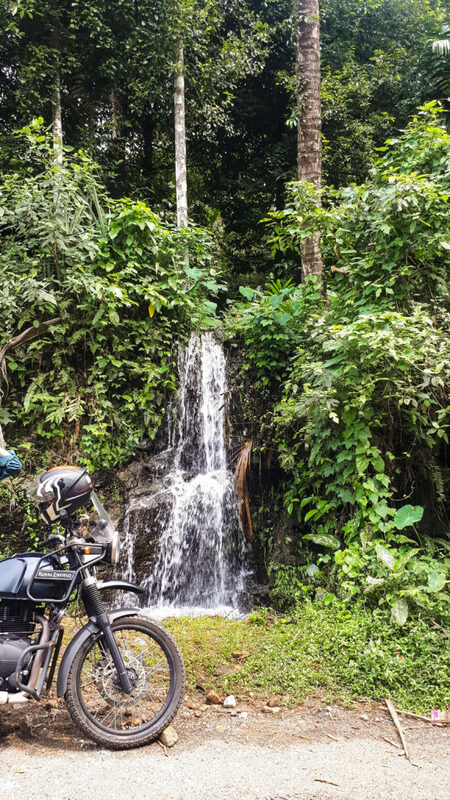 A few kilometers away from the waterfall, we decided to fill up the Himalayan. It was at this time that we realized we were very low on cash. Google Maps showed that there was only a single ATM close by, but upon arriving at the ATM we found that it had no cash. We had the option of going back, but decided to keep going as far as the remaining cash would allow us to. Fortunately for us, the ticket cost for both the waterfalls including parking turned out to be the exact same amount that we were left with. 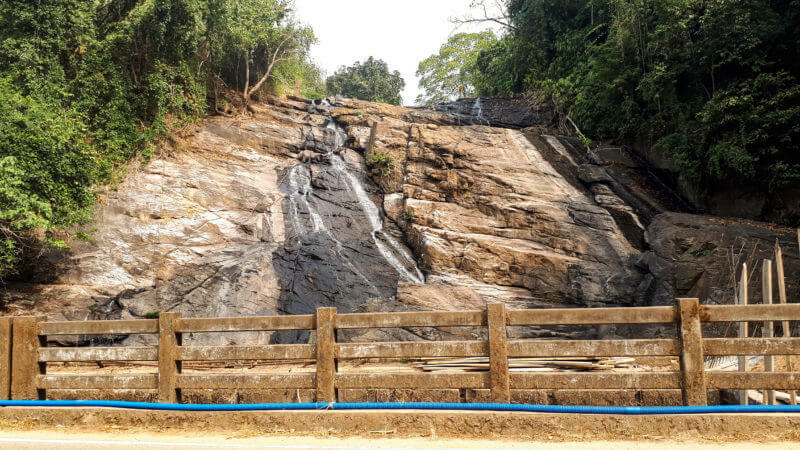 We got the first big picture of Athirappilly waterfall from the view point on the road and oh boy, was it wide! You could see why it is referred to as the Niagara falls of India. It is beautiful and I’m sure it will be even more so during the rainy season. Athirappilly waterfall from the view point. When we reached the entrance of the Athirappilly waterfall there were already quite a few people there. We walked about 400 meters from the entrance to the top of the waterfall. As the water level was not too high we were able to sit on the rocks at the edge and enjoy the view from the top. Note that entry into the river is prohibited for safety reasons. 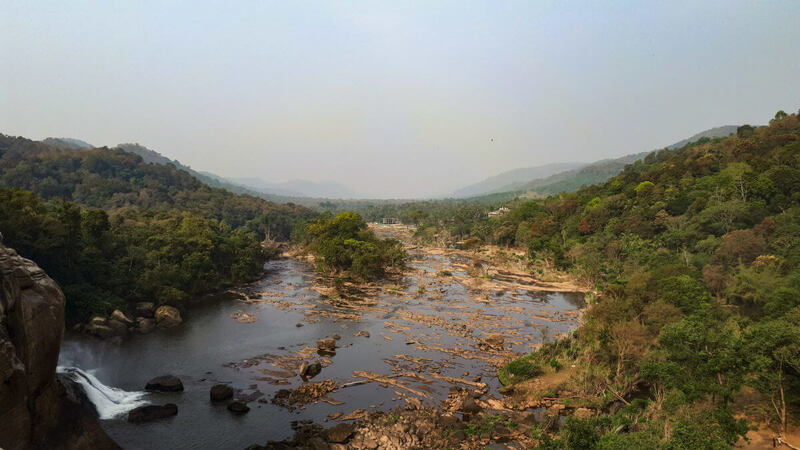 View from the top of the Athirappilly waterfall. After a while we walked down to the base from where there is a diagonal view of the waterfalls. This walk is comparatively rougher than the one from the entrance to the top of the waterfall. Next was Vazhachal. 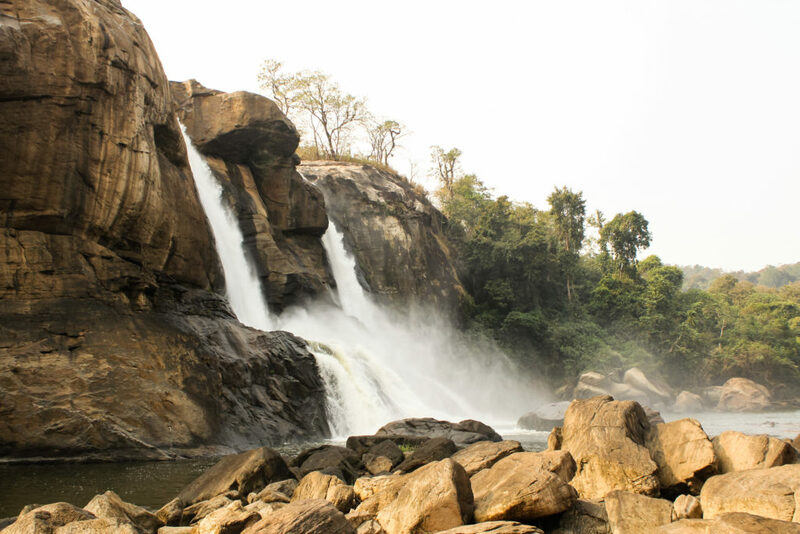 Located at around 5 KM from Athirappilly waterfall, Vazhachal is like an elder sister to Athirappilly considering that the former is the source to the latter. 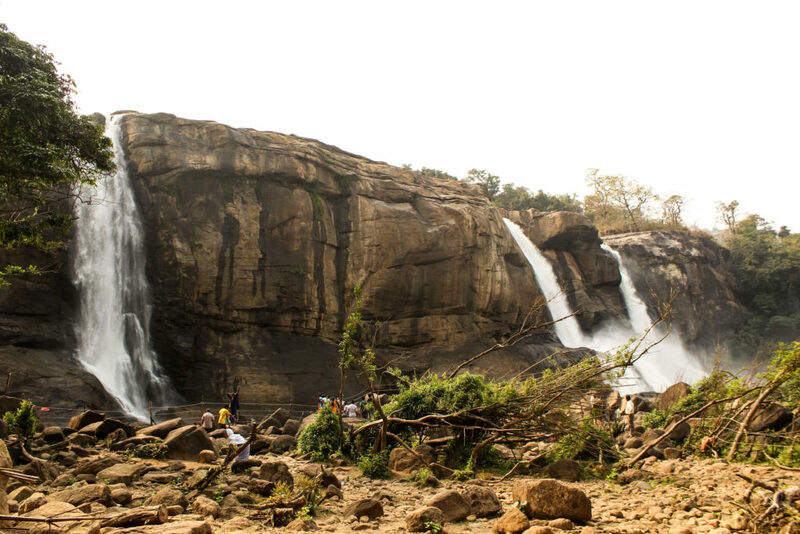 Though unlike Athirappilly, Vazhachal is a smaller, cascading waterfall. Next to the waterfall, the forest department has put up a nice park with lots of benches. 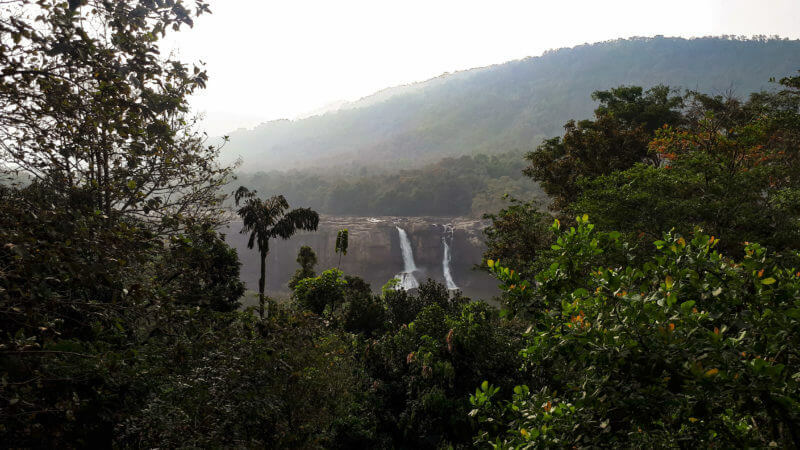 After the short trek to the Athirappilly waterfall, one can come here, sit and enjoy the beauty of Vazhachal waterfalls with forest in the background. 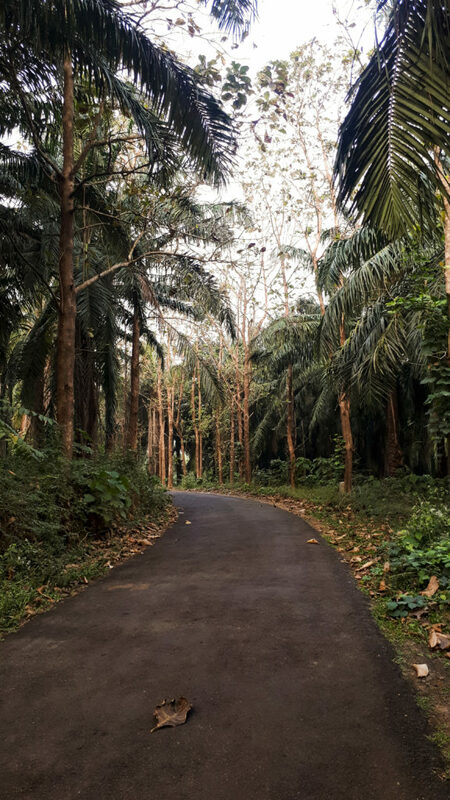 When planning the trip I had looked at the area around the waterfalls on Google Maps and noticed a couple of interesting places beyond Vazhachal waterfalls, an Elephant zone and Sholayar Reservoir view point. We were especially looking forward to ride through the Elephant zone but to our disappointment, two-wheelers are not allowed beyond Vazhachal waterfalls. There is a forest check post near the entrance of the waterfall that monitors all traffic that flows beyond this point. Having our trip cut down to half of what we had originally planned, we headed back to our homestay early. 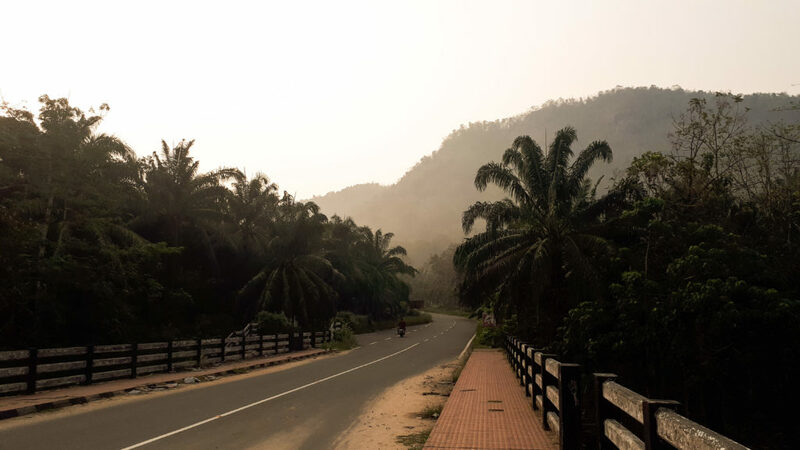 As our last activity before leaving the area, we stopped by Rainforest Resort which is located right under the Athirappilly view point. I had read this resort has an unobstructed view to the waterfall and indeed one can see the entire width of the waterfalls from the open dining area. 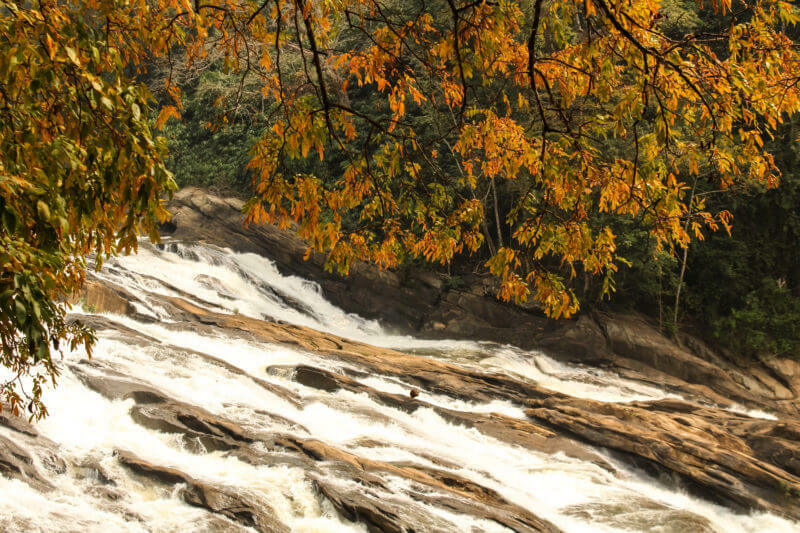 View of the Athirappilly waterfall from Rainforest resort. 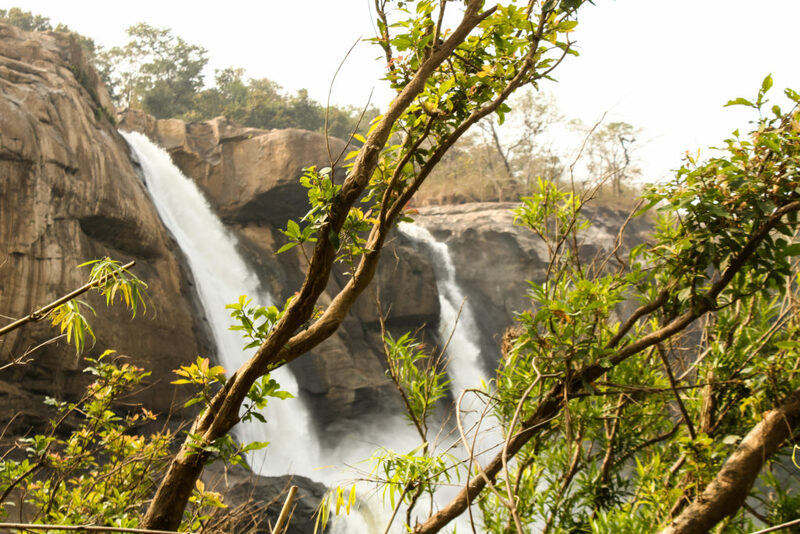 There is another notable waterfall located between the Athirappilly and Vazhachal – Charpa waterfall. This is alongside a bridge and does not require any tickets. At this time of the year there was barely any water flowing through, but pictures during the rainy season indicate a healthy amount of water-flow. On the way back, we withdrew some cash and had lunch at Navya bakers. Prices were reasonable and food was good. It also seemed to be quite popular with the locals. 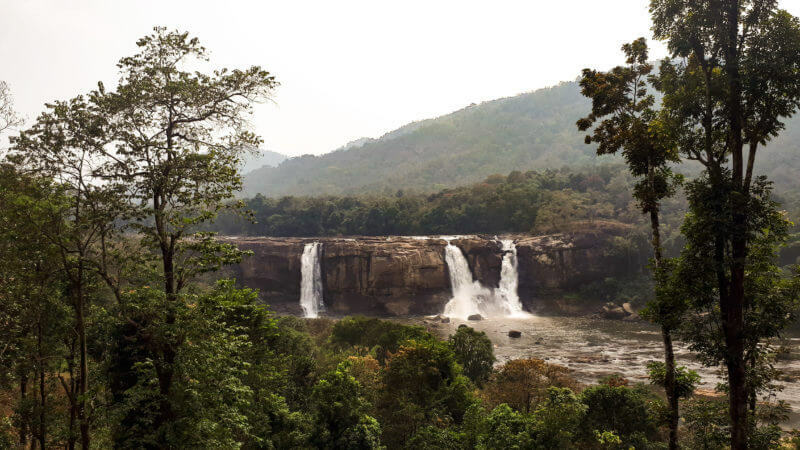 PS: Athirappilly waterfall is a popular movie location. Raavan, Bahubali and the Barso-re song in Guru are a few movies that have been shot here. We stayed at home and followed the routine that we have on non-travel days – eat, sleep, work and exercise, in no particular order. The drive to the waterfalls was smooth as we drove on NH544 and SH21. On the road through out the forest reserve we saw officers patrolling the area on foot. 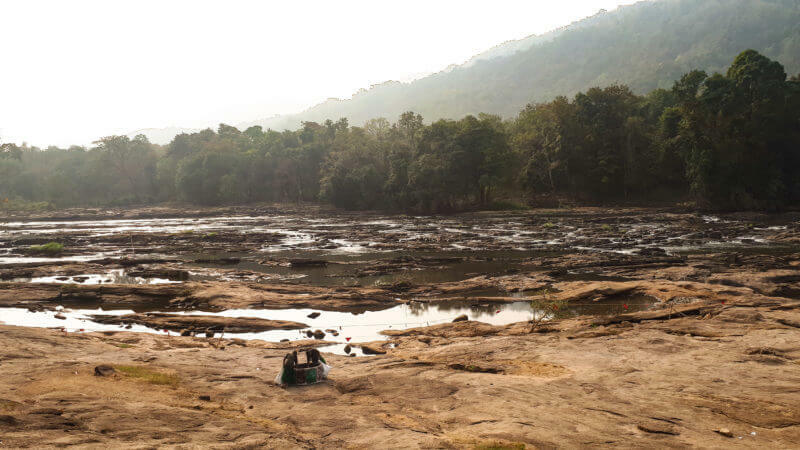 At Athirappilly waterfalls, we noticed workers cleaning up garbage left over by tourists. In spite of the littering, the waterfalls were much cleaner than any other waterfalls that I have been to throughout India. Ideally there should be no littering and we should learn to travel responsibly but it was good to see the forest department cleaning up after us, that too at a nominal entry fees. We have so many generations ahead of us who have as much rights as we do, to enjoy these beautiful places. Workers cleaning up the Athirappilly waterfall area.